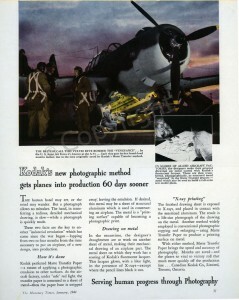 Feature from the Collections: Who is this man in the Archives? Peter. It’s his name. An interesting fellow, don’t you think? 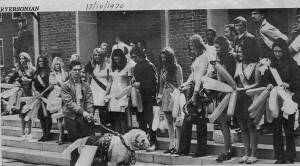 Peter, as he’s known, was given his nickname soon after arriving at Ryerson in 1967. 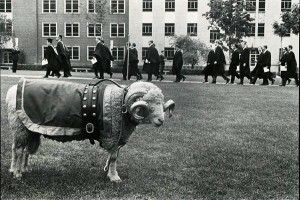 He resided in the reception area of President Fred Jorgenson’s office, then in Kerr Hall South. 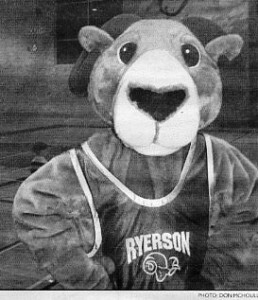 He was created by artist Julius Damasdy, (1937/38 – ) in the late 1960s and was anonymously donated to Ryerson by a founding member of the Board of Governors, Franc Joubin, who acquired him from a show of the Ontario Society of Artists. Peter is part of the university’s art collection. 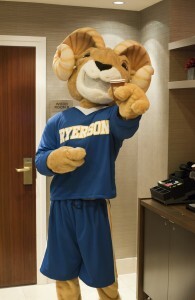 After two years of dismally greeting staff and visitors alike, Peter was moved to where he could cheer up the students. 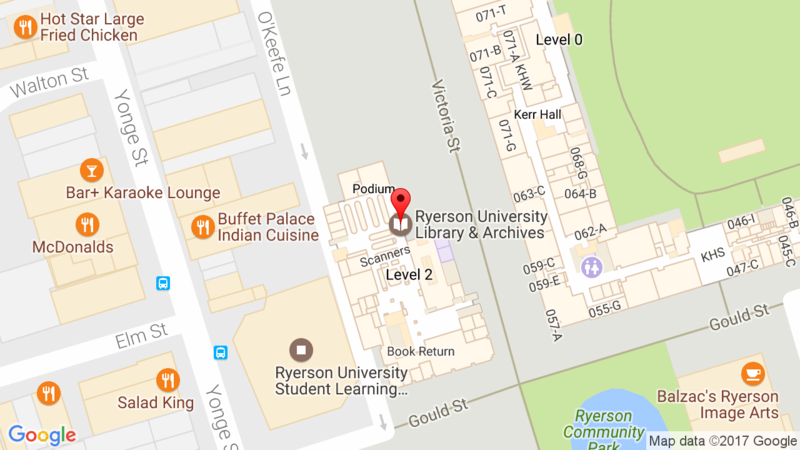 What better place than the Library (located, then, in the former Business Building, now the Victoria Building). When the Library moved to its current location in the Library Building in 1974, Peter insisted he come along. His new home was in a semi-dark area (they tried to hide him) near the 2nd floor elevators. 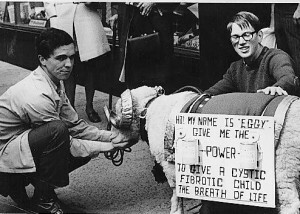 Peter got a medical diagnosis in the mid 1970s by a some Ryerson nursing students which they posted on him stating, for example, he suffered from: Malnutrition, Scoliosis, Stove Pipe Legs, Middle Age Spread, Facial Paralysis, and other interesting ailments. 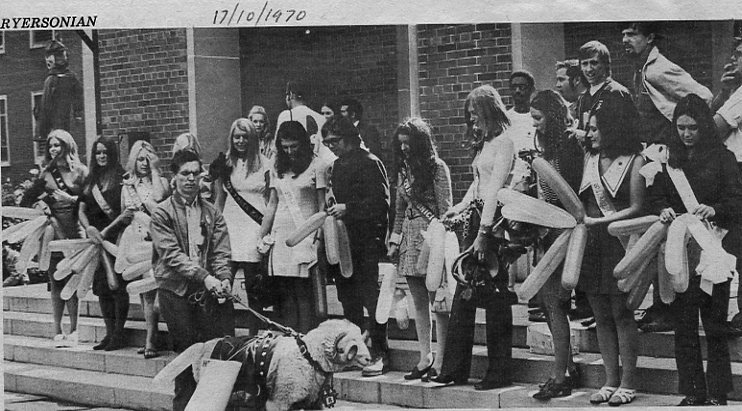 Finally, in an attempt at banishment, Peter was offered to the Archives in the mid 1970s. 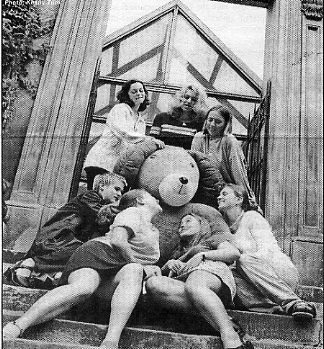 He was cheerfully accepted and has been in safekeeping since, still creeping-out Archives staff and a few researchers. To meet Peter, read his other ailments, and decide if he has any creepy or otherwise ill effects on you, feel free to come to the Archives on the 3rd floor of the Library. He will be happy to see you! 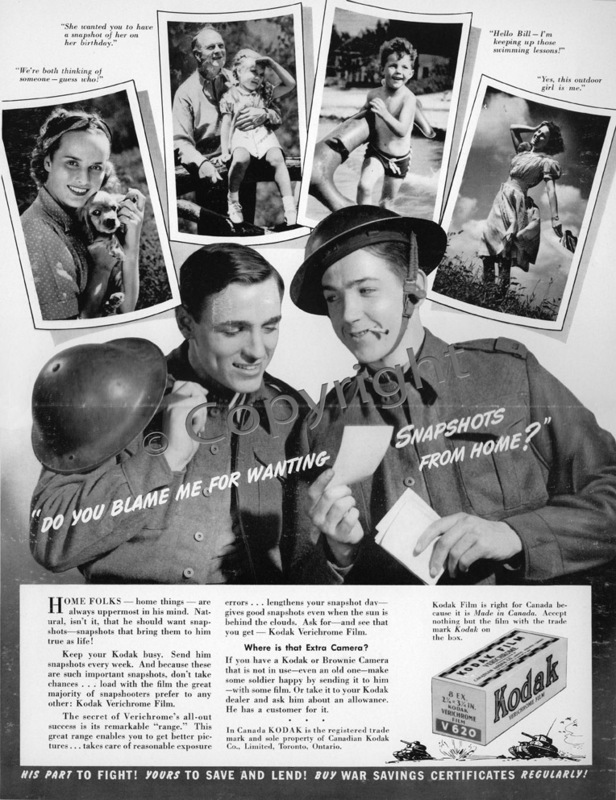 You can also visit our new Archives & Special Collections website and online database. 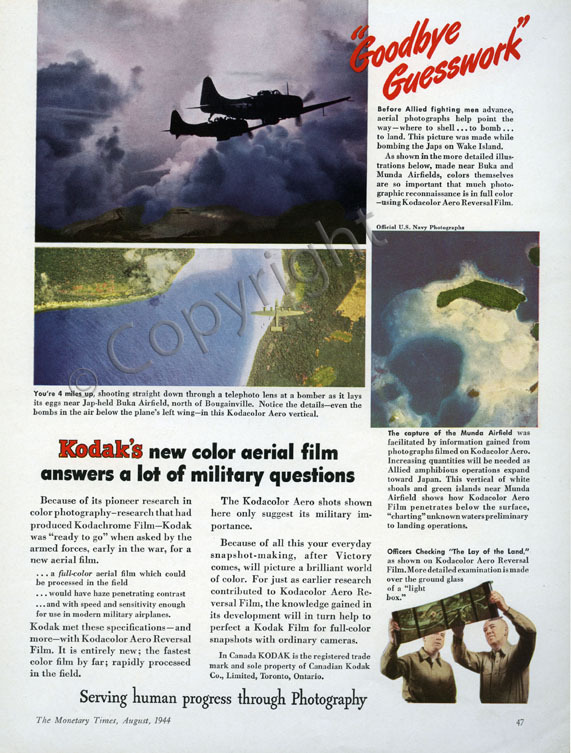 Please note the both are still in development. 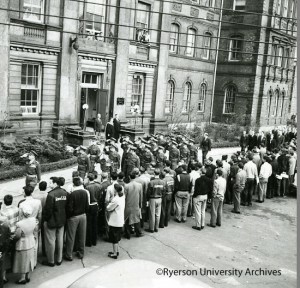 http://www.ryerson.ca/archives/. 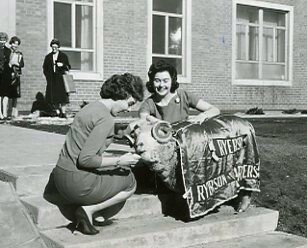 Sixty years ago Ryerson’s men’s varsity teams were called the Ryerson Rams. 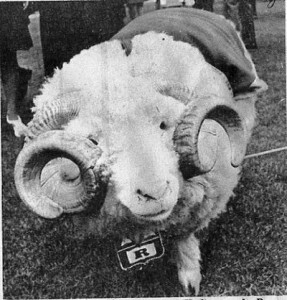 Why the ram? 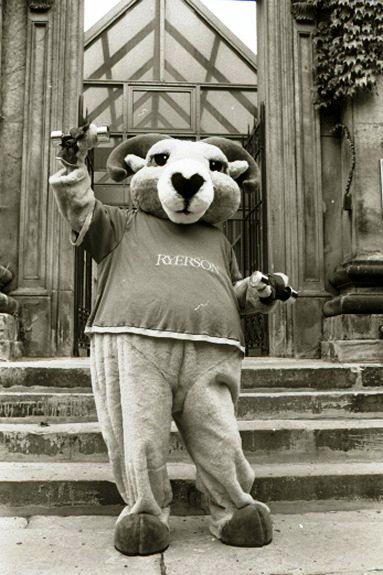 One theory is the school’s namesake, Egerton Ryerson, was born on March 24, 1803 – the ram in the zodiac. 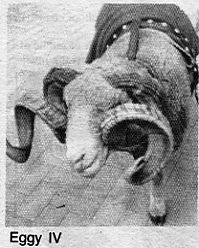 Aries the ram is described as an extrovert with energy, assertiveness, a competitive nature and while courageous, impulsive and stubborn. 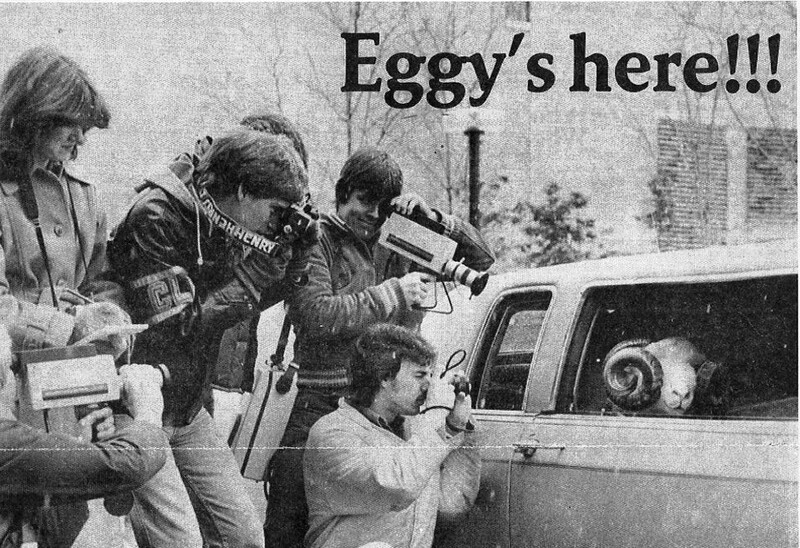 We all know our beloved Eggy. We see him at school events. 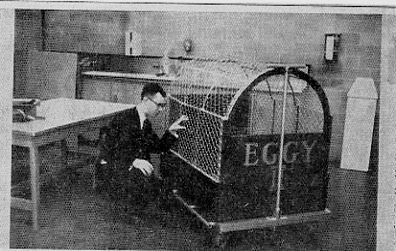 Not so long ago, in the near-distant past of 1961, Eggy had a, shall we say, realistic look. Four students from the Student Administrative Council, wanting to boost school morale, acquired a ram for a reported $25 from the Toronto Stockyards. 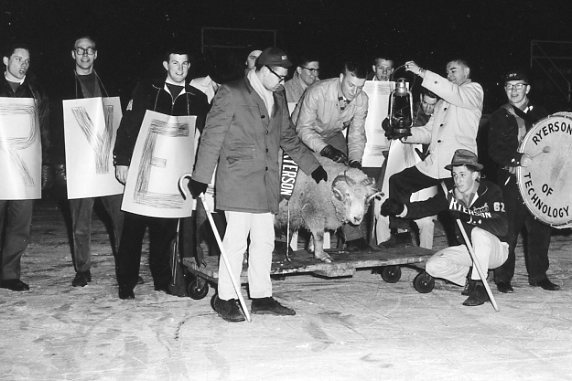 The little ram, decorated with Ryerson pendants and ribbons made his grand debut at a Varsity Arena hockey game with Waterloo University. Ryerson subsequently won the game, the little ram became a hero, and the rest is history. 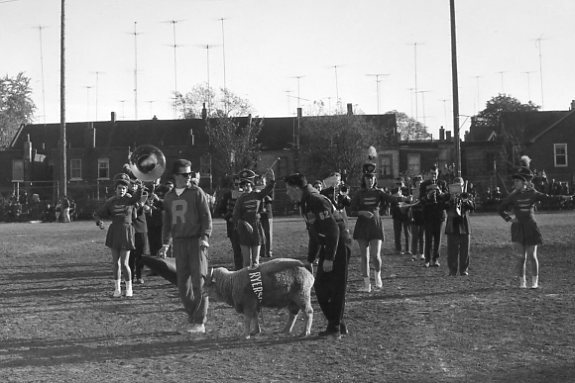 Then, as today, Eggy attended celebrations, sporting, and parade and picnic events. There were a total of five real ram mascots between 1961 and 1991. 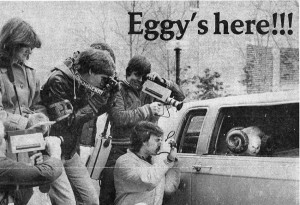 Eggy I lived on campus during the school year in a pen and shelter behind Oakham House (then called Kerr Hall) and spent the summer on a farm outside the city. Eggy II did the same until the mid 1960s. 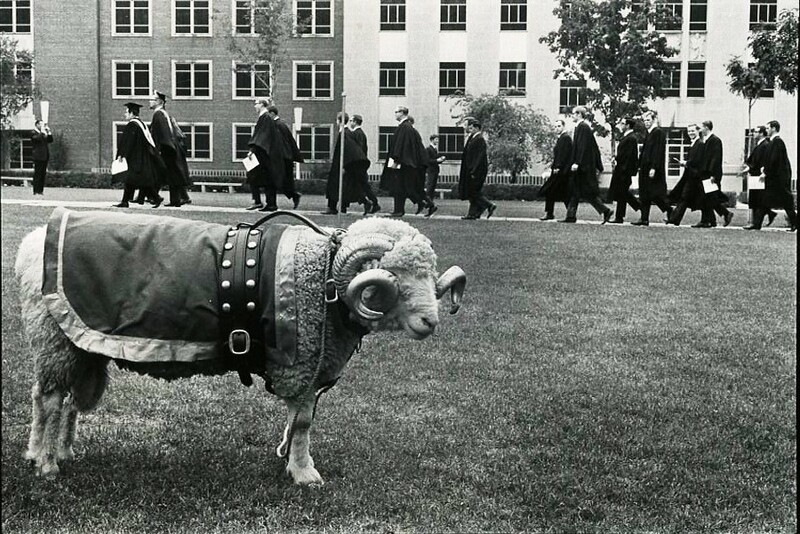 From that time, Eggy II through V lived on a farm year long and was transported to campus for events. 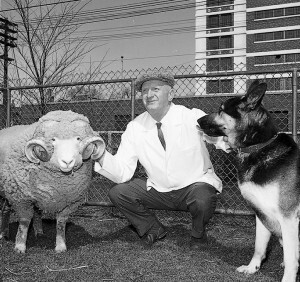 Eggy III was known to be a little ornery, charging bales of hay, fence posts, his handler, and just about anything in front of him. Eggy IV is reported to have been gentle and willing to pose for photos. Eggy V was the last live mascot. 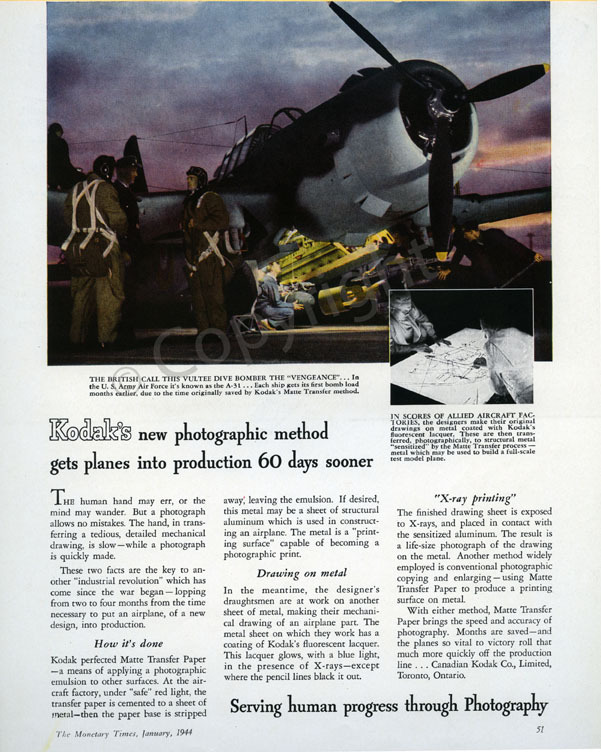 He died in 1991. The Human Society pressured universities using live animals as mascots to stop the practice due to cruelty. 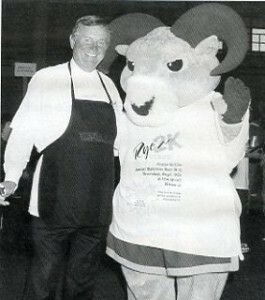 While the real Eggy was still making appearances, Athletics and Recreation had a costumed Eggy from about the 1980s. Possibly the first costumed Eggy – we’ll call him Costumed Eggy 1 – had a triangular nose and had developed floppy horns. heart-shaped nose with hoofed hands and feet. cornered nose with hoof hands and running shoes. grey/silver and flatter sitting horns. his mean face and his party face. To learn more about Eggy and other Ryerson history facts, visit the Ryerson Archives, 3rd floor of the Library, Monday to Friday 9:00 a.m. to 5:00 p.m. And visit our new Archives and Special Collections website.